On Monday, in remembrance of Martin Luther King Jr., Family HealthCare Network (FHCN) partnered with the Woodlake Rotary to renovate the Woodlake Veterans Memorial Building for the national day of service. The Woodlake Veterans Memorial Building, located at 355 W. Acacia St. in Woodlake, is used by the local Rotary Club for special events to raise money for scholarships, community projects, and various youth service activities. Each year, volunteers of FHCN’s Community HealthCorps Americorps team participate in a local community service project for the national day of service. This year, the group of 12 volunteers, along with community members, will assist in the project by patching up, and repainting interior walls and ceilings of the structure. 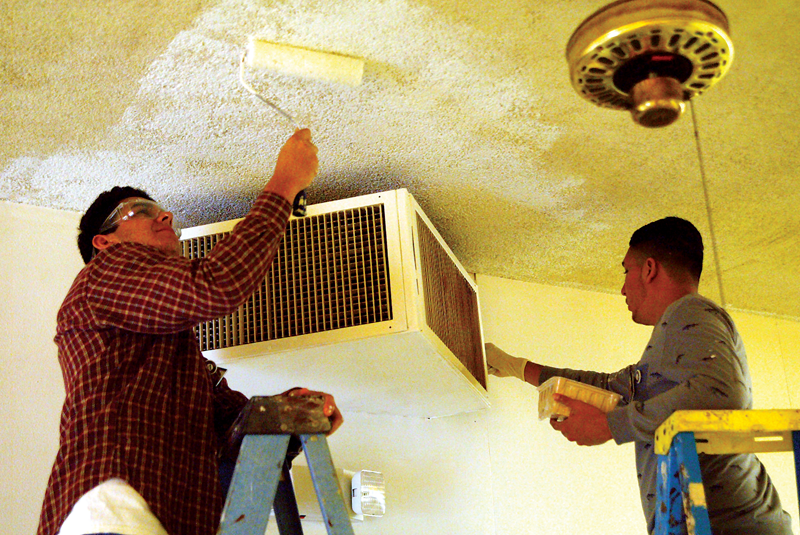 Volunteers will also refinish countertops and replace ceiling fans in many of the rooms throughout the building. This renovation project was voted on by members of the Woodlake community as it will benefit local veterans and various community groups that utilize the space. The service project has also received generous donations from Mitcham Industries Inc., The Home Depot, and Wal-Mart. Nancy Murillo, an Americorps volunteer stationed at Family HealthCare Network’s Woodlake Health Center, presented the project to the other volunteers because the building is used for so many events and also is a monument to the veterans who selflessly served their country and the community. members volunteered to pull weeds, prune bushes and skirt trees at the Bravo Lake Botanical Gardens in Woodlake. FHCN President and CEO Kerry Hydash said FHCN has a dozen HealthCorps volunteers stationed at several of its 16 federally qualified health centers. She said these volunteers provide a huge benefit to FHCN and its mission to bring health and health information out into the communities they serve. Committed to a one-year term of service, 12 volunteers from the national Community HealthCorps® program volunteer at FHCN health centers annually and are trained on a variety of topics and strategies to reach medically underserved communities. Founded in 1995 by the National Association of Community Health Centers, Community HealthCorps Americorps is the largest health-focused, national AmeriCorps program, promoting health care for America’s underserved, while developing tomorrow’s health care workforce. Volunteers help man booths at health fairs, do health screenings and pass out information at events. Like most HealthCorps Americorps volunteers, Murillo said she spends most of the year reading to children to promote literacy, translating information for patients or doing outreach for insurance enrollment and new services at the Woodlake Health Center. For more information about the Family HealthCare Network Community HealthCorps® AmeriCorps program, contact Nikki Gilman, Marketing and Communications Coordinator at 559-737-4746, or visit www.FHCN.org. Family HealthCare Network is a private nonprofit organization that operates 20 sites, 16 of which are federally qualified health centers located throughout Tulare and Kings Counties. Their mission is to provide quality health care to everyone in the communities they serve. With more than 160 medical and dental providers in their network, they provide access to a wide range of coordinated health services. FHCN also offers pharmacy services, free transportation, and extended evening and weekend hours. FHCN is recognized by the National Committee for Quality Assurance (NCQA) as a Level 3 Patient Centered Medical Home and is dually recognized by The Joint Commission with its Gold Seal of Approval for Patient Quality and Safety and as a Patient Centered Primary Medical Home. For more information about, call 1-877-960-3426, or visit our website at www.FHCN.org, like them on Facebook or follow them on Twitter at www.Twitter.com/FHCN.